~ I'm not a photographer. First day back from vacation and I spent it doing some of the post shoot work I had left over from the SMP shoot in June. As I’m typing this I’m also uploading the pictures I took of Tyger G to the Zivity website. 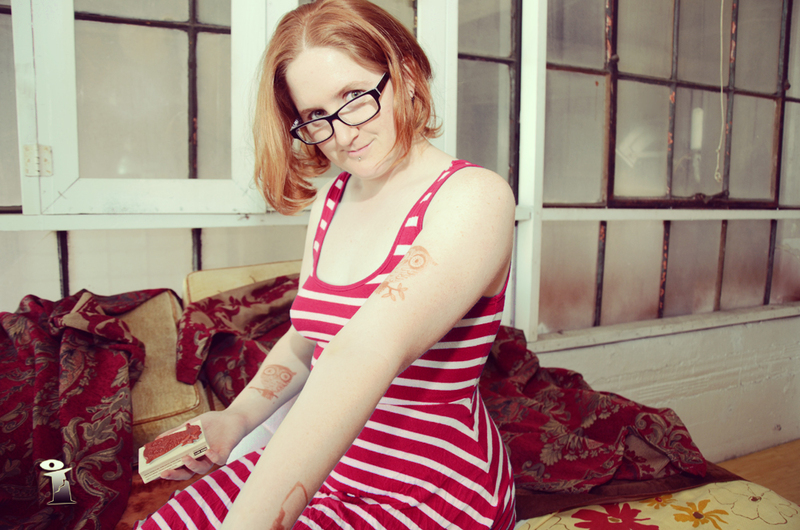 I think I have learned a little from the last couple of sets I submitted to Zivity. I changed my angles around to make the images more interesting. I also tried to automate the changes I needed. One of the big changes I made to all the images was to turn Tyger’s blue dress into a red one. I did that with an adjustment layer that selected only the blue of her dress. I then had its hue altered to become red. Rather than having to do that to all the images I was able to copy the layer to each image. I had 193 images to work with I and I broke them down into two sets. Getting Ink On (45 images). Bonus – Getting Ink Off (25 images). © Michael Love and Adventures with my camera, 2014. Excerpts and links may be used, provided that full and clear credit is given to Michael Love and Adventures with my camera with appropriate and specific direction to the original content.